These notes about Alan’s life in the band are kindly provided by Betty Knight. 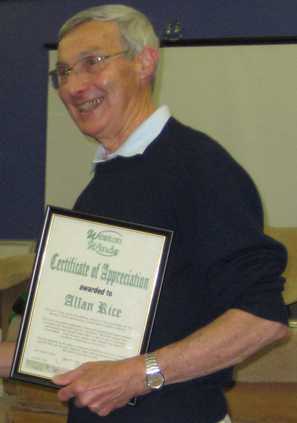 Alan Rice joined the Weston Winds about a year after its inception. He had been recruited by Nev White who had played in the same recorder group as he had. Alan loved being in the band, he was a very enthusiastic member, practised diligently and was always willing to help in any way needed. For many years he kept the band archives, only passing them over at the time of our 20th anniversary. Even a bad fall which entailed some broken bones in his hand and fingers did not stop him from coming along to practice. Alan was also a guide at the National Library and used the facilities there to research the program notes—I know Mike missed that terribly when Alan became too unwell to continue. He loved his music, but also the written word and was quite likely to quote poetry or Shakespeare if he felt it appropriate. He and I practised flute and piano on Monday mornings—he loved Couperin, church and baroque and also the love songs of the Edwardian era—”Come into the garden Maud” being a particular favourite. We would sit and have a cuppa and he and my husband would swap notes on marmalade making—something they both enjoyed doing! Alan was a modest and unassuming man with impeccable manners and loved life. He counted himself very fortunate to have his music, his adored wife Val and their daughters Sarah and Emily.